Instant Pot Orange Chicken–A Chinese take-out is made healthier at home in less than 30 minutes for an easy dinner recipe your whole family will love. 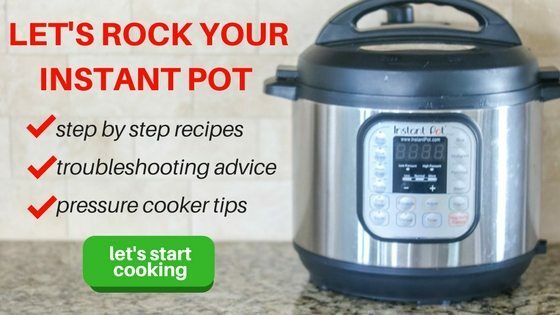 I have been making easy Instant Pot recipes with success for years now, but my first attempt at creating a recipe for my Instant Pot was a complete disaster. COMPLETE disaster. I tried to make my favorite Orange Chicken out in the Instant Pot. What I neglected to realize what that I could not put cornstarch in my Instant Pot at the start of cook time. Let’s just say I had a mess to clean up and dinner was not edible. It has taken me a long time to desire to try out orange chicken in the pressure cooker again. But after I mastered Sweet and Sour Chicken and Mongolian Beef, I knew I could once again try to make Instant Pot Orange Chicken. Orange Chicken is a favorite at Chinese restaurants. A little sweet, a little spicy, and full of flavor. Orange chicken is kid-friendly, picky-husband approved and ready in less than 30 minutes–making it a winner in this busy mom’s book. Step One: Prepare your chicken by slicing into 1 inch chunks. Step Two: Sear your chicken in the Instant Pot. To sear your chicken, turn your Instant Pot to saute. Once it reads “HOT,” add in 1/2 -1 tablespoon oil and let heat for 1 minute. Add in the cubed chicken and saute until JUST browned. About 2 minutes. Step Three: Make the Orange Sauce. Most Chinese Orange Sauces contain lots of sodium and sugar. 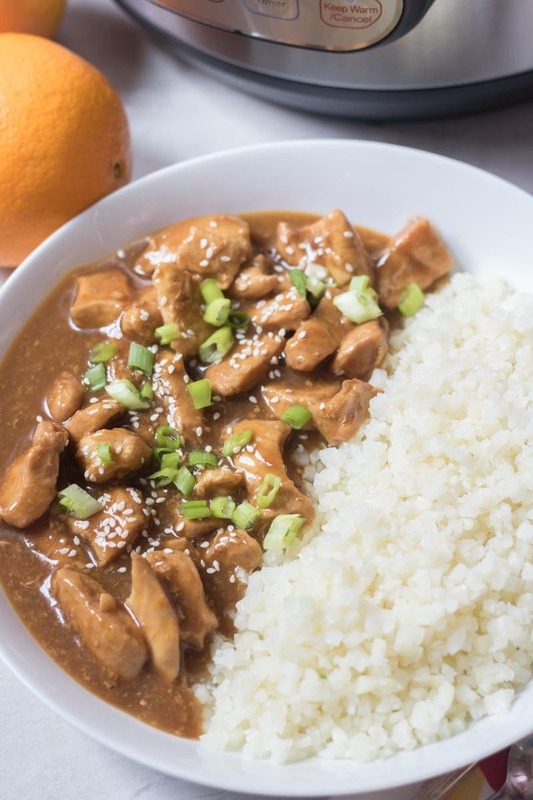 By making orange chicken at home, you can control how much sodium and added sugar you add to your Instant Pot Orange Chicken. I use reduced sodium soy sauce to reduce the sodium content and a mix of orange juice and a bit of honey for the sweetness in this sauce. Step Four: Cook the Orange Chicken. Put lid on Instant Pot and turn vent knob to the sealed position. Hit manual (you will have to first turn the Instant Pot OFF from Saute function) and then adjust the cook time by using the plus or minus buttons to 7 minutes. After cook time has elapsed, let rest 5-10 minutes and then do a quick release. Step Five: Thicken your orange sauce. Orange Chicken is great served over steamed rice or with cauliflower rice. Can you make Orange Chicken with Frozen Chicken? Yes, you can absolutely make Orange Chicken with frozen chicken. However, you will need to keep a few things in mind. You can not sear frozen chicken, so eliminate that step along with the oil from the recipe. Instead, you just add the ingredients for the sauce along with the frozen whole chicken breasts. Increase cook time from 7 minutes to 10 minutes. Once the cook time has elapsed, let the pressure release naturally 5 minutes. Do a quick release and remove chicken breasts to cutting board and cut into large chunks or shred chicken. Turn Instant Pot back to saute. Make a cornstarch slurry by mixing cornstarch with 2 tablespoons water until fully combined. Add cornstarch slurry to pressure cooker and stir and boil for 2-3 minutes. Mix the chicken into the sauce and serve. The chicken will not be the same nice chunks when the chicken is cooked from frozen, but it is still incredibly delicious. Feel free to use boneless, skinless chicken thighs in place of the chicken breasts for homemade orange chicken. If you do not want to use brown sugar, honey can be substituted. You can also increase honey or brown sugar if you sweeter dishes. I would not increase to more than 1/4 cup. 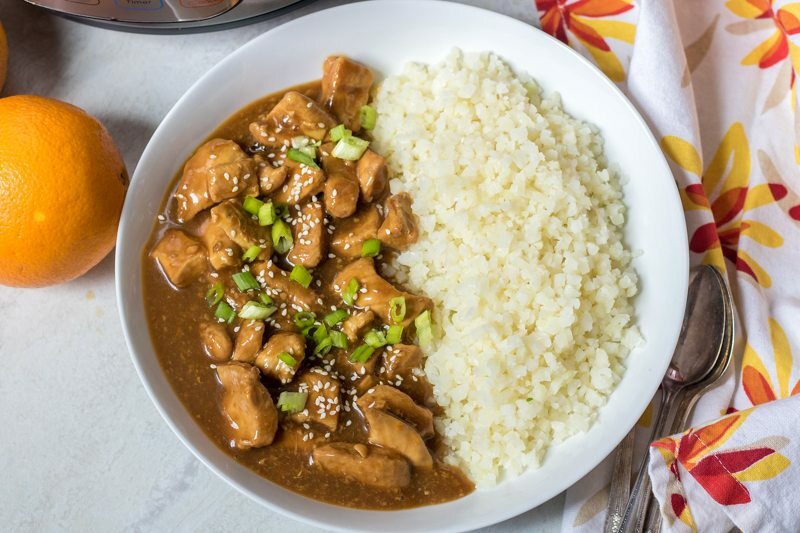 Use Tamari for a Gluten-Free Instant Pot Orange Chicken. Add in up to 1 teaspoon of red pepper flakes to add spice to your orange chicken recipe. A healthier Chinese take-out is made in less than 30 minutes in the Instant Pot, for an easy dinner recipe your whole family will love. Turn your Instant Pot to saute. Once it reads "HOT," add in 1/2 -1 tablespoon oil and let heat for 1 minute. Add in chicken and saute until JUST browned--about 2-3 minutes. Add in orange juice, orange zest, brown sugar, soy sauce, rice wine vinegar, ginger and garlic to instant pot. Close the pot, and set the valve to seal. Set the manual button to "high pressure" and set the timer for 7 minutes. Note: you will have to FIRST turn off the instant pot from the saute function. Let naturally release for 5 minutes. Then do a quick release. Serve with steamed rice, cauliflower rice and scallions if desired. This turned out so well! The leftovers were almost as good as the firsts. YAY! So glad you enjoyed Sarah. I love it when we have leftovers too–but in this house, that rarely happens! I love this orange chicken recipe! It is a much healthier and more economic way to satisfy my take-out craving than actually ordering take-out! My wife just bought the Instant pot and I was asked to check it out first. I had fun checking the instant pot out, that I decided to look for some recipes. As I was surfing the web, I came across you website and saw the Orange Chicken and I love Orange Chicken. So I surprised her with her first meal from the Instant pot and it was a huge success. This recipe is amazing and easy to follow. The absolute best Orange Chicken that I have ever eaten. (And not just because I made it, LOL). My wife was tremendously impressed and I plan on using more of your recipes. Thank you!! Thank you so much for sharing Tommy! I am so glad you enjoyed this recipe! And I love that you cooked for your wife–SO sweet. Can’t wait to hear what else you enjoy! I’m anxious to try the Orange Chicken recipe. Please tell me why it says to use 3/4 C orange juice DIVIDED. I don’t see any instructions about dividing into parts. Hi! I am updating this now, it should NOT say, divided. Sorry about that! Hi, if I wanted to make 2 pounds of chicken what I double the ingredients and keep the same time only in the pressure cooker? So easy, tasty and healthy. I’ve really been enjoying your recipes (going on ~3 Months with Instant Pot and you are my go-to). Thanks! Oh Ellen, that makes my heart so happy. I hope you keep finding recipes to enjoy in your instant pot from me.